Gods of Fire expands on Ghost Archipelago with a mix of various elements. There are new treasures and bestiary, as well as rules for small boats. 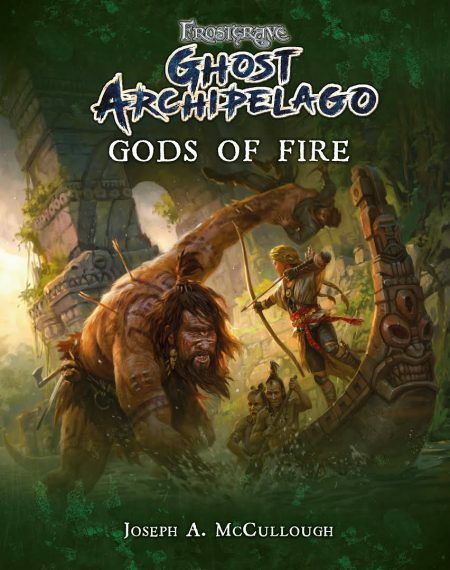 The more remarkable sections are a chapter on making and playing as various tribal groups and three campaigns where players play tribes along side the standard Ghost Archipelago crews. The new monsters include some interesting challenges fitting to the fire theme like fire eels, salamanders, and the Kraken, a giant monster that will probably work best with a scenario built around it. There are a couple of new sentient races such as the Cathaka- bird people. I'm hoping some figures are made to suit them, but in the meantime I will use some substitutes from Reaper, Bushido, and elsewhere. The treasures include several inspiring artifacts. As could be expected, the mechanics for most boil down to a situational bonus. for me, the stand out among the treasures in Gods of Fire is the golden skull, which evokes the theme of Ghost Archipelago and also has the unique effect of making it possible for a heritor or warden to take over an undead monster. Perhaps saving the best for last, I am going to give a couple of examples of tribes created with the rules in Gods of Fire. First are some Iroquois minis I painted on a whim a couple of years back. Not being much interested in playing out the colonial history of America and lacking other Native Americans for them to fight, they have not had much chance to appear on the table. My Iroquois will take a trip to the Ghost Archipelago. I am going to use the random tribe generation rules for this group. This means rolling on a chart to see how many positive and negative attributes they have, then rolling on a second chart to randomly determine those attributes. for the number of attributes, I get a result of one positive and one negative. The randomly determined positive attribute is Pain Masters and the negative one is Poor Tool Makers. The end result of this is that they are never counted as wounded but when attacking have a -1 damage modifier and a chance of breaking thier weapons. Not bad for a random selection. For a second sample tribe I will be using some bronze age Europeans. In this example, I will be assigning them attributes. The rules allow one positive attribute with the option of adding a second at the cost of taking a negative attribute. You are also allowed to assign any number of additional negative attributes, if you wish. I am going to give them the positive attributes Armour Weavers and Demon Binders. In order to balance the second positive, I give them the negative attribute Cursed. So, this tribe makes light armor and can recruit a treelike monster called a scarbark. in the book the light armor is described as made from plants, but I am going to use that attribute to explain the bronze plates some of the figures wear. The Cursed attribute reduces the will of every member of the tribe and makes them count as undead. I really enjoy the tribe creation rules. It allows for the creation of the varied tribes one reads about in fantasy fiction with out indulging in the unsavory racist attitudes that can be found in some of the literature that influenced fantasy gaming. While at first blush the tribes in Ghost archipelago can have an vague "otherness" that to some degree lumps together several segments of humanity, the tribal attributes gives each one a unique combination of motivations, cultures and technologies that makes them characters and not caricatures in the game. Thanks to Osprey Games for sending us a review copy of Frostgrave Ghost Archipelago Gods of Fire.